Wendy was barely 20 years old when she received a devastating diagnosis: juvenile amyotrophic lateral sclerosis (ALS), an aggressive neurodegenerative disorder that destroys motor neurons in the brain and the spinal cord. “The authors established communication with complete locked-in patients, which is rare and has not been demonstrated systematically before,” says Dr. Wolfgang Einhäuser-Treyer to Singularity Hub. Einhäuser-Treyer is a professor at Bielefeld University in Germany who had previously worked on measuring pupil response as a means of communication with locked-in patients and was not involved in this current study. An implant that beams instructions out of the brain has been used to restore movement in paralysed primates for the first time, say scientists. Rhesus monkeys were paralysed in one leg due to a damaged spinal cord. The team at the Swiss Federal Institute of Technology bypassed the injury by sending the instructions straight from the brain to the nerves controlling leg movement. Experts said the technology could be ready for human trials within a decade. Spinal-cord injuries block the flow of electrical signals from the brain to the rest of the body resulting in paralysis. It is a wound that rarely heals, but one potential solution is to use technology to bypass the injury. In the study, a chip was implanted into the part of the monkeys’ brain that controls movement. Its job was to read the spikes of electrical activity that are the instructions for moving the legs and send them to a nearby computer. It deciphered the messages and sent instructions to an implant in the monkey’s spine to electrically stimulate the appropriate nerves. The process all takes place in real time. The results, published in the journal Nature, showed the monkeys regained some control of their paralysed leg within six days and could walk in a straight line on a treadmill. Dr Gregoire Courtine, one of the researchers, said: “This is the first time that a neurotechnology has restored locomotion in primates.” He told the BBC News website: “The movement was close to normal for the basic walking pattern, but so far we have not been able to test the ability to steer.” The technology used to stimulate the spinal cord is the same as that used in deep brain stimulation to treat Parkinson’s disease, so it would not be a technological leap to doing the same tests in patients. “But the way we walk is different to primates, we are bipedal and this requires more sophisticated ways to stimulate the muscle,” said Dr Courtine. Dr Andrew Jackson, from the Institute of Neuroscience and Newcastle University, said: “It is not unreasonable to speculate that we could see the first clinical demonstrations of interfaces between the brain and spinal cord by the end of the decade.” However, he said, rhesus monkeys used all four limbs to move and only one leg had been paralysed, so it would be a greater challenge to restore the movement of both legs in people. “Useful locomotion also requires control of balance, steering and obstacle avoidance, which were not addressed,” he added. The other approach to treating paralysis involves transplanting cells from the nasal cavity into the spinal cord to try to biologically repair the injury. Following this treatment, Darek Fidyka, who was paralysed from the chest down in a knife attack in 2010, can now walk using a frame. Neither approach is ready for routine use. Scientists have long been on a quest to find a way to implant electrodes that interface with neurons into the human brain. If successful, the idea could have huge implications for the treatment of Parkinson’s disease and other neurological disorders. Last month, a team of researchers from Italy and the UK made a huge step forward by showing that the world’s favorite wonder-material, graphene, can successfully interface with neurons. Previous efforts by other groups using treated graphene had created an interface with a very low signal to noise ratio. But an interdisciplinary collaborative effort by the University of Trieste and the Cambridge Graphene Centre has developed a significantly improved electrode by working with untreated graphene. Prior to experimenting with graphene-based substrates (GBS), scientists implanted microelectrodes based on tungsten and silicon. Proof-of-concept experiments were successful, but these materials seem to suffer from the same fatal flaws. The body’s reaction to the insertion trauma is to form scarring tissue, inhibiting clear electrical signals. The structures were also prone to disconnecting, due to the stiffness of the materials, which were unsuitable for a semi-fluid organic environment. Pure graphene is promising because it is flexible, non-toxic, and does not impair other cellular activity. The team’s experiments on rat brain cell cultures showed that the untreated graphene electrodes interfaced well with neurons, transmitting electrical impulses normally with none of the adverse reactions seen previously. The biocompatibility of graphene could allow it to be used to make graphene microelectrodes that could help measure, harness and control an impaired brain’s functions. It could be used to restore lost sensory functions to treat paralysis, control prosthetic devices such a robotic limbs for amputees and even control or diminish the impact of the out-of-control electrical impulses that cause motor disorders such as Parkinson’s and epilepsy. The results of this research were recently published in the journal ACS Nano. The research was funded by the Graphene Flagship, a European initiative that aims to connect theoretical and practical fields and reduce the time that graphene products spend in laboratories before being brought to market. Paralyzed man walks again, using only his mind. 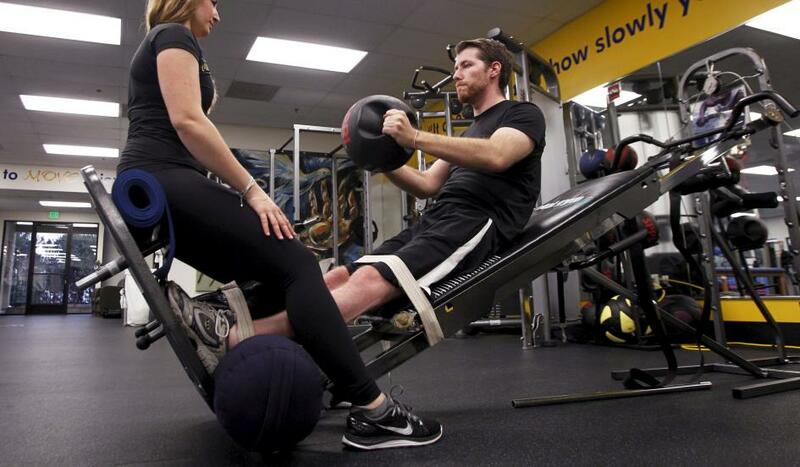 Paraplegic Adam Fritz works out with Kristen Johnson, a spinal cord injury recovery specialist, at the Project Walk facility in Claremont, California on September 24. A brain-to-computer technology that can translate thoughts into leg movements has enabled Fritz, paralyzed from the waist down by a spinal cord injury, to become the first such patient to walk without the use of robotics. It’s a technology that sounds lifted from the latest Marvel movie—a brain-computer interface functional electrical stimulation (BCI-FES) system that enables paralyzed users to walk again. But thanks to neurologists, biomedical engineers and other scientists at the University of California, Irvine, it’s very much a reality, though admittedly with only one successful test subject so far. The team, led by Zoran Nenadic and An H. Do, built a device that translates brain waves into electrical signals than can bypass the damaged region of a paraplegic’s spine and go directly to the muscles, stimulating them to move. To test it, they recruited 28-year-old Adam Fritz, who had lost the use of his legs five years earlier in a motorcycle accident. The next step was to transfer that newfound skill to his legs. The scientists wired up the EEG device so that it would send electrical signals to the muscles in Fritz’s leg. And then, along with physical therapy to strengthen his legs, he would practice walking—his legs suspended a few inches off the ground—using only his brain (and, of course, the device). On his 20th visit, Fritz was finally able to walk using a harness that supported his body weight and prevented him from falling. After a little more practice, he walked using just the BCI-FES system. After 30 trials run over a period of 19 weeks, he could successfully walk through a 12-foot-long course. Moritz believes it’s unlikely that an EEG alone would be reliable enough to extract any more specific input from the brain while the test subject is walking. In other words, it might not be able to do much more beyond beginning and ending a simple motion like moving your legs forward—not so helpful in stepping over curbs or turning a corner in a hallway. The UC Irvine team hopes to improve the capability of its technology. A simplified version of the system has the potential to work as a means of noninvasive rehabilitation for a wide range of paralytic conditions, from less severe spinal cord injuries to stroke and multiple sclerosis. “Once we’ve confirmed the usability of this noninvasive system, we can look into invasive means, such as brain implants,” said Nenadic in a statement announcing the project’s success. “We hope that an implant could achieve an even greater level of prosthesis control because brain waves are recorded with higher quality. In addition, such an implant could deliver sensation back to the brain, enabling the user to feel their legs. There have been tentative steps into thought-controlled drones in the past, but Tekever and a team of European researchers just kicked things up a notch. 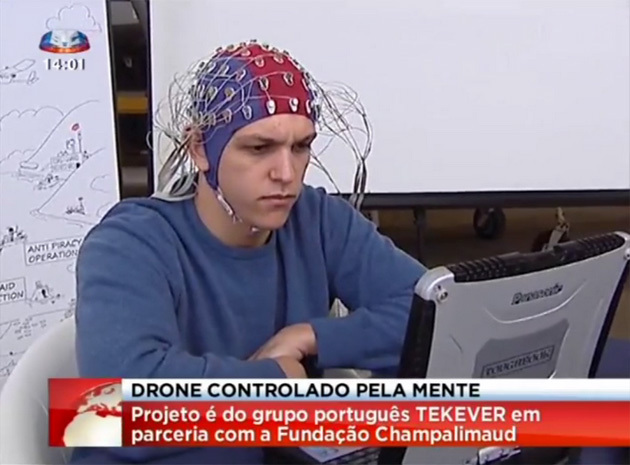 They’ve successfully tested Brainflight, a project that uses your mental activity (detected through a cap) to pilot an unmanned aircraft. You have to learn how to fly on your own, but it doesn’t take long before you’re merely thinking about where you want to go. And don’t worry about crashing because of distractions or mental trauma, like seizures — there are “algorithms” to prevent the worst from happening. You probably won’t be using Brainflight to fly anything larger than a small drone, at least not in the near future. There’s no regulatory framework that would cover mind-controlled aircraft, after all. Tekever is hopeful that its technology will change how we approach transportation, though. It sees brain power reducing complex activities like flying or driving to something you can do instinctively, like walking — you’d have freedom to focus on higher-level tasks like navigation. The underlying technology would also let people with injuries and physical handicaps steer vehicles and their own prosthetic limbs. Don’t be surprised if you eventually need little more than some headgear to take to the skies.